LEMAS Four-Roll Plate Rolls | Ultimate Tube Bender Parts Plus, Inc.
LEMAS Four-Roll Double-Pinch Plate Bending rolls.LEMAS has been distributing metal fabricating machinery in the United States for over 20 years including hundreds of plate bending rolls delivered since 2001. LEMAS specializes in sheet metal fabricating equipment including hydraulic plate bending rolls delivering thousands of machines to satisfied customers around the world. Over 50 years of continuous operations have provided valuable experience and a solid foundation in the competitive global market. Innovation, quality, value and service are what LEMAS products represent around the world. LEMAS 4-Roll double-pinch bending rolls feature hydraulic adjustment of the bending rolls and the lower pinch roll with separate convenient pinch pressure adjustment. In addition, both bending rolls are hydraulically tiltable for cone rolling, and the hydraulic drop end makes it simple to remove the completed cylinder from the rolls. 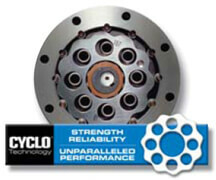 Sumitomo Cyclo® 6000 gear-less speed reducers, featured on all LEMAS plate rolls, uses a unique epicycloidal design superior to conventional speed reducers using common tooth gears. Unlike teeth-style gears with limited contact points, a Cyclo has two-thirds of its reduction components in contact at all times. This design enables Cyclo speed reducers and gear-motors to withstand shock loads exceeding 500% of their ratings, and provide exceptional performance, reliability and long life in the most severe applications. Other standard features include Direct-Drive Design using no belts or chains, cone rolling attachment, rolls heat treated to 50Rc, digital readouts for positioning both side bending rolls, and much more. LEMAS 3-ROLL PLATE ROLLS ALSO AVAILABLE! -Hydraulically powered bending rolls – No manual adjustment needed. -Control panel on wheels with digital readouts for position of both side bending rolls – All machine controls easily located. -Sumitomo Cyclo® 6000 gear-less speed reducers – The hardest working in the industry.